Standing at the top of mountain peaks ranging from 6,000 to 13,000 feet in elevation was mind blowing. It was my first time living and running in true altitude…and it was amazing, but also so humbling to experience as a flatland runner . I have a new found appreciation for the mountains and valleys, mountaineers, mountain runners, and anyone else challenging themselves to reach the top. For those too fearful or not up for the climb, take the risk – you are missing out on a piece of life that simply can’t be replicated in a photo. I decided it was important for me to do Tim Olson’s Run Mindful Retreat in the spring time because I am so hardwired to race…to continue to push my limits…to never back down. Even I know that’s not good!…and I just simply needed time to run with no pressures, no judgments, and no plan for that day other than to just enjoy the view. Of course, I did continue my training with Rivers during this time, and it was scheduled appropriately….just enjoy the run and learn something new. My motivation…meet new people, turn my inner spaz off, and get out of Milwaukee. My daily intention…take the pressure off and smile. So that’s what I did and I learned so much about my running, my body, and my personal self. The long weekend started with an early flight into Denver. I arrived at the Boulder Adventure Lodge (I loved it and highly recommend it!) with not much to do, so I continued reading Eat & Run (I swear Ill finish it soon – I’ve only been at it for like a year now!). When I was able to get into my room, I suited up for some exploration. Asa, at the front desk, told me exactly how to run to the fun town of Boulder. Nope. Didn’t make it. So I went for a run to almost Boulder, but with some missed turns, I ended up enjoying some time in the park and looking at different houses in the area. I put in an hour, down the mountain and back up, with great thoughts and vibes for the weekend. Later that day, it was time for the retreat. Tim did introductions and of course it was that awkward ‘I know no one here’ uneasiness. But let me tell you, we all warmed up to each other, and everyone was incredible. I met very inspiring people this weekend from around the globe. We went out for 5 miles to the top of a small mountain…meditated…and then came back. And then the best part – we ate!! Food was provided by RAD…Real Athlete Diets, the best thing in the entire world and if I didn’t love my job, I would open that up to this area! I wasn’t sure about this meditation thing…its never been my thing, but after the first day, I embraced it and have been doing a simple meditation since. And it works. Simply taking out the “run” in running made running actually better. What does that even mean?! Running for me is competing…winning…its reaching goals no one thought possible…and its not enjoying scenery without tripping and falling on my face! Taking the run out meant slowing down mentally. Physically, I kept up with the top guys and loved every minute. I was running with a different purpose. Yes, to get to the top of the mountain because that meant I could sit for a minute, but I was running with less anxiety, less pressure, and more concerned with keeping positive thoughts, being in tune with my body, and not passing judgment. It felt so different, I can’t even explain it. The next two days we ran up a couple different mountains, and I think I may have somewhat conquered my fear of heights…going to the top of Bear Peak might be easy for those who grew up in the mountains, but for me it was steep and frightening! I spider-manned myself to the rocks for the last 10 feet and sat in a divot of one rock. The guys joked that they were at 8500 feet and I was at 8490 feet because I didn’t get up the final 10 ft…I was okay with that 🙂 Just being there and seeing the vastness of the area – simply incredible. ‘Why haven’t I moved?’ kept repeating in my head over and over again. I think I know what to do about that and yes, the time will come soon when I see mountains daily, its just a matter of picking which range! 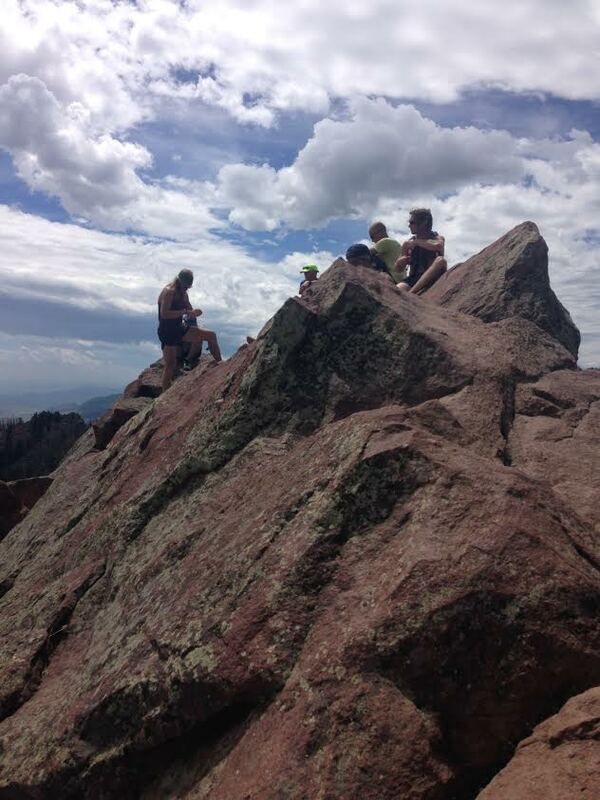 The guys (Tim, Mauri, Keith, Dave, Gus, Billy, Diedrick) at the top of Bear Peak…with me 10 feet lower. The workshops, meditation, yoga, and good food combined with long runs in the morning made for an exceptional 3 day weekend. Hearing stories from other runners, Tim’s adventures in the elite trail running world, and the inside jokes out on the trails were only a couple highlights from the weekend. I walked away from a “running retreat” learning how to connect my body to my run, accept pain, and create bonds with other runners that I know will last a lifetime…a couple of people I will see in the next few months, and will be taking another runner up on racing/pacing together very soon. It was hard to leave on Sunday afternoon, but I had one more full day of CO running with my great friend Kyle (Hitting 13,000 feet) before heading back to WI. Some people may consider this adventure unrealistic beyond the weekend, but I see it as a door opening to my future in the ultra endurance world. 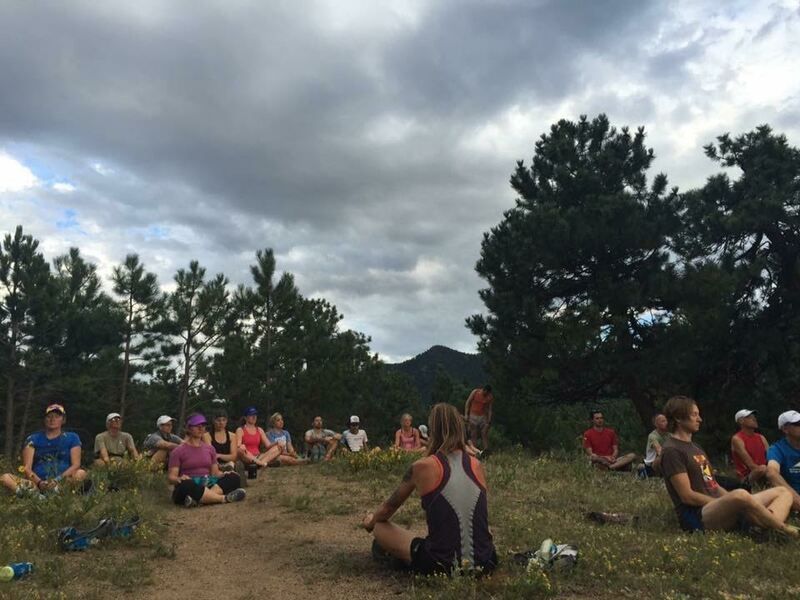 If you are considering a “running camp,” I would recommend not a skills camp, but rather a retreat to disconnect from the world and take the ‘run’ out of running – create a new sense of running and deeper connection to your runs. Although I loved Tim’s retreat, my next adventure will be to the land of Flagstaff for some training with Rivers and co…after some racing this fall/winter of course! 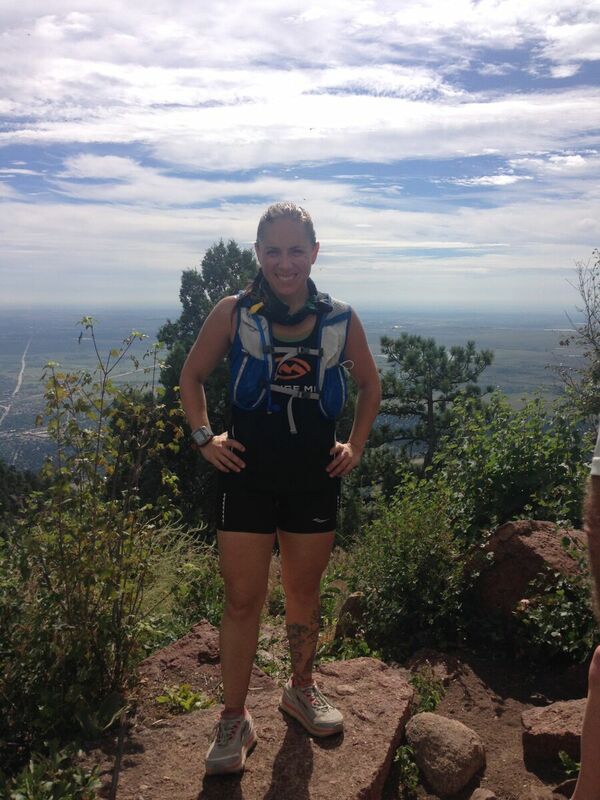 Fuel/Hydration: I consumed ClifBar products, LaraBar, and VFuel – all worked fabulous. Water only – my Orange Mud handheld was perfect for the short runs, and used my 70oz pack for the longer days. Shoes: Altra Olympus – in all honestly, I wish I would have used a different Altra shoe for this adventure – a bit more traction or stability would have helped on the slippery rocks – the Lone Peak would have been a winner I think. I also learned my lesson – better to tie your shoes tight enough or you will fall on hard rocks!…Luckily I only had about a dozen ankle rolls. Phew! 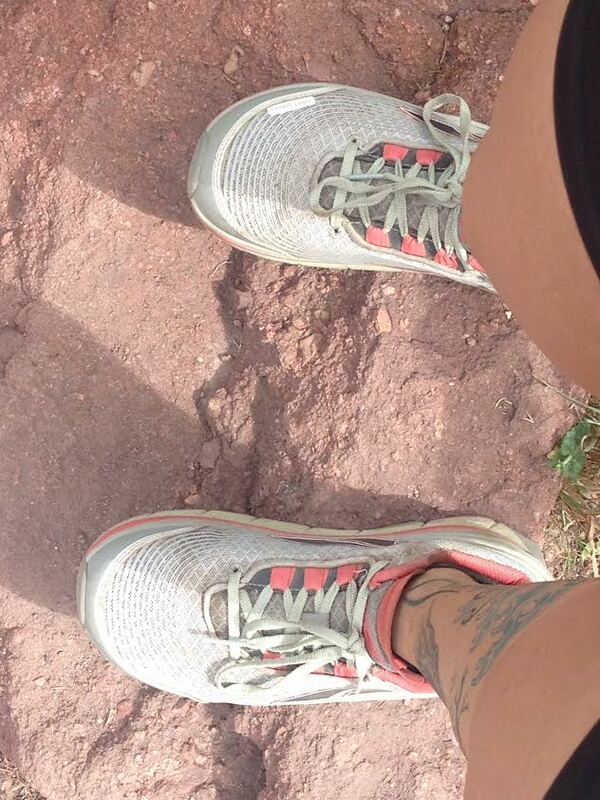 Standing on Green Mountain in my Altra Olympus shoes – the best. A huge thank you to Tim and Krista Olson, and also Bob and Debbie Loomis, for all the hard work put into creating the retreats.